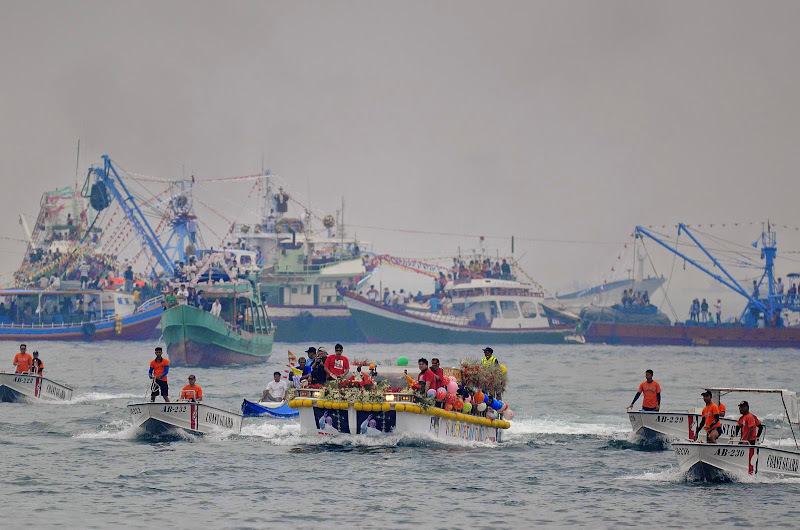 GENERAL SANTOS CITY (16 January 2015) – At least 200 fishing vessels sailed the waters of Sarangani Bay to join the fluvial procession for the Feast of Sto. Niño Thursday (January 15). The Feast of Sto. Niño is one of the most awaited festivals here in General Santos City. It is a celebration centered in Barangay Bula as a way of giving thanks to the patron saint for the bountiful catch of fishing firms that have flourished in the city. City Mayor Ronnel Rivera was present to show support for the festival and explained why it is a very significant event. “Gensan is a city made and built by fishing. A huge portion of our economy is sustained and developed by our fishing industry for decades already. It is a good thing that we celebrate… and we give thanks,” Mayor Rivera said. In line with that, the SOCKSARGEN Federation of Fishing and Allied Industries has already stated that they support Mayor Rivera in strengthening the fishing industry of the city. “We may not expect a huge rise in the industry anymore but we do not expect also a big fall. The fishing industry will remain stable for the years to come,” the mayor said. The fluvial parade is one of the most anticipated events of the festival. It features Bula’s fishing vessels sailing from the shore of Gensan at Queen Tuna Park towards Sarangani Bay and then back while carrying the statue of Sto. Niño. A fishing boat from the RLG Fishing Company carried the Sto Niño statue and led the fluvial parade which started at around 6:30am and came back to shore at around 8:30am. Later the Sto. Niño was handed to an amphibian vessel owned by Domeng Congson to be transported to Barangay Bula. This part of the festival is locally known as the “Salubong”. Devotees rushed towards the amphibian vessel as it reached the shoreline in attempt to get a flower from its decorated bow. The faithful believed that the flower will bring blessing and abundance for an entire year. Some devotees have also brought their own Sto. Niño statues to partake in the celebration. More or less 2,000 people were present during the fluvial parade. Aside from the parade, the Isda-Isdaan Festival is also integrated in the Patronal Feast of Barangay Bula giving more color and flavor to the activity. It was anticipated that thousands of people from other barangays of Gensan were coming to Bula for the celebration.